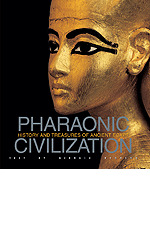 Pharaonic Civilization sheds light on the principal events, cultural and social processes, and religious beliefs that influenced and shaped the development and flowering of a civilization on the Nile that lasted for thousands of years. Almost from the time the Egyptian state came into being with the unification of the ‘Two Kingdoms,’ the pharaohs immortalized their lives and achievements with the construction of stone monuments. This book looks at these wonders, including the pyramid tombs of the Old Kingdom, whose architectural evolution can be followed from the first step pyramid of Djoser to the magnificent pyramids of Giza, and on to the necropolises of Abusir and Saqqara. Monumental sculpture and private burial are also examined here, two areas that found new expressive forms during the First Intermediate Period and the Middle Kingdom. And ample space is reserved for the pharaohs of the New Kingdom, who with their military campaigns made Egypt one of the most powerful empires of the Near East. Thanks to superb color photographs, the reader is able to admire the prodigious output of Egyptian art in all its splendor. The book also examines the last centuries of the age of the pharaohs, up to the period of Greek and then Roman control of Egypt, an era when Egyptian culture came into contact and in some cases fused with the Hellenistic and Roman cultures of the time.